SEATTLE, Washington - The Museum of Flight made the first public showing of the restored remains of the F-1 rocket engines used to launch NASA's historic Apollo 12 and Apollo 16 missions to the Moon on Thursday, which was also the anniversary of the Apollo 12 Moon landing on November 19, 1969. The historic engines were recovered from the Atlantic Ocean off the Florida coast by Seattle-based Bezos Expeditions in 2013 and have been under conservation at the Kansas Cosmosphere and Space Center. 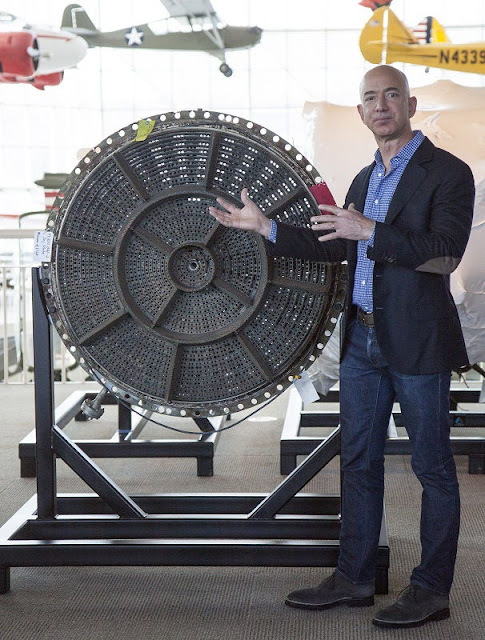 At the request of the Bezos Expeditions team, NASA granted the artifacts to the Museum for permanent display in Seattle, Washington. One Apollo 12 artifact will be on temporary public display beginning November 21. The engines boosted the 40-story Saturn V rocket from liftoff until the edge of space, then separated with the first stage of the rocket and fell 40 miles through the atmosphere and came to a final rest on the bottom of the Atlantic Ocean. Subsequent stages of the rocket propelled the Apollo spacecraft into orbit and on to the Moon. For the next 43 years, the F-1 engines were lost and beyond human recovery, deeper than the wreck of the Titanic. However, Bezos Expeditions found and recovered the engines from the bottom of the Atlantic in 2013. "It took a lot of 21st century underwater tech and an extraordinary team of skilled professionals to find and recover these historical treasures and, thanks to them, NASA, and The Museum of Flight, now a whole new generation of young people will be able to see these amazing engines on display," said Amazon CEO Jeff Bezos, who is the founder of Bezos Expeditions. "When I was five years old I watched Neil Armstrong step onto the moon and it imprinted me with a passion for science and exploration - it's my hope that these engines might spark a similar passion in a child who sees them today." "Exhibiting these historic engines not only shares NASA's storied history, it also helps America educate to innovate," said NASA Administrator Charles Bolden. "This display of spaceflight greatness can help inspire our next generation of scientists, technologists, engineers and explorers to build upon past successes and create the new knowledge and capabilities needed to enable our journey to Mars." Photo credit: Ted Huetter/The Museum of Flight.